Nikon Digital SLRs combine the latest in technology with ease of use to produce incredible digital images. Not only does the Nikon heritage set you apart from the rest, its unmatched ergonomics and stunning image quality empowers you with better performance that allows you to enjoy every photo you take. With a Nikon Digital SLR camera in your hands, it’s your chance to take the world of photography to new levels. You will never want to lose a delicately captured photo with Nikon DSLR. However, if an accident really happens, you should know how to recover Nikon DSLR deleted JPEG and NEF photos. NEF is a RAW format exclusively for Nikon DSLR cameras, so you may need a solution to preview NEF RAW image on Windows computer. Is it possible to recover photos from Nikon DSLR after deletion? Accidentally delete some important photos from your Nikon DSLR cameras? Don’t be panic. When photos are deleted from your camera memory card, the photos disappear from your camera. However, their contents are not immediately destroyed. Your camera storage system simply marks the space where the deleted photos occupied as being available for use by the new created file. If you manage to start an undelete process before your camera use that part to create new file, you still have a great opportunity to get the lost files back. Nikon DSLR Photo Recovery software is specially designed to recover deleted photos from Nikon Digital SLR cameras as well as other storage media. The program will perform a thorough scan of your camera storage drive, find, locate and recover not only deleted JPEG but also Nikon RAW NEF files with high efficiency and quality. Support most kinds of memory cards made by SanDisk, Kingston, Lexar, Samsung, etc. Now you just need to free download the Nikon DSLR photo recovery software and install it on your computer, then follow steps below to perform the photo recovery. Step 1: Launch Jihosoft Photo Recovery on your computer. Connect your Nikon camera to computer through a USB cable or take the memory card out of the camera and connect it to the computer via a card reader. 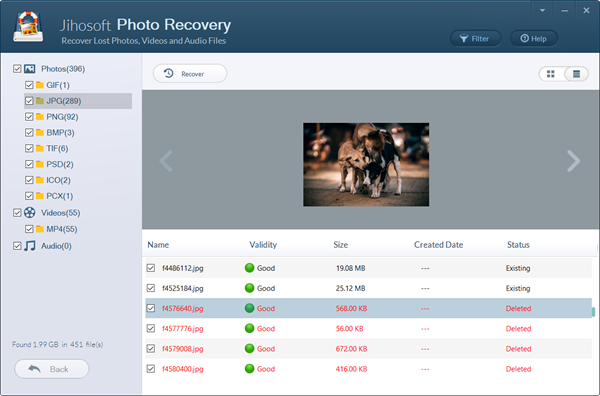 Then launch the Photo Recovery program, and click Recover Photo. The program will detect your camera storage card and display it on the interface of the software. Select the storage media and hit Advance Scan button. Step 2: Define file types to recover. In the new window, tick JPG, NEF and other formats you need under Photo section. Then hit Scan Now button to commence the scanning process. 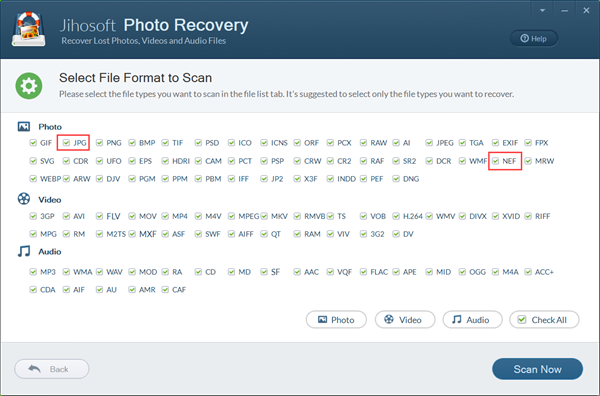 Step 3: Recover deleted photos from Nikon DSLR. The scanning process will take few minutes. When the scan is over, all the recoverable file types will be listed in the left panel, you can click them and view in the right pane either by thumbnails or list. Finally, check those files you want to recover and hit Recover button. 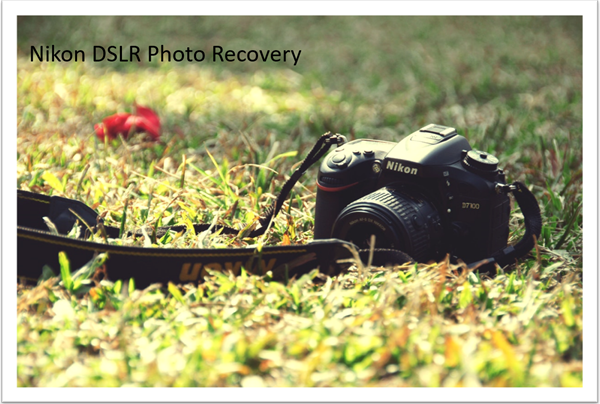 Once the recovery is completed, you will be able to check the recovered Nikon DSLR images. 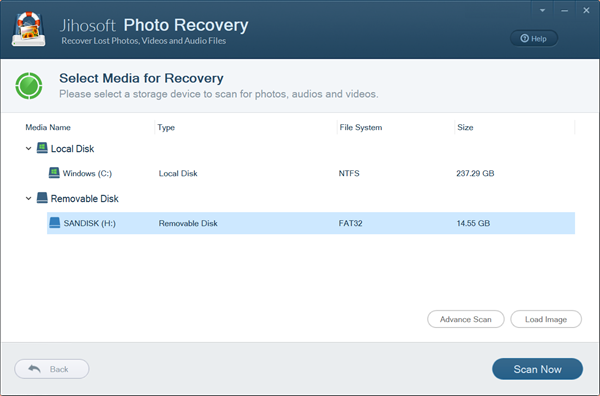 The photo recovery software is also able to recover photos from Canon camera. Feel free to drop a line in the comment area should you have any question about how to recover photos or view RAW files.